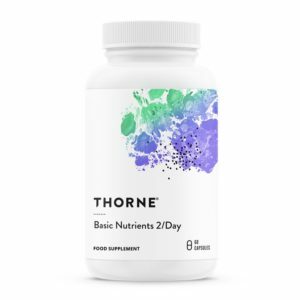 Basic Nutrients 2/Day, provides a comprehensive multi-vitamin/mineral complex. It’s key nutritional features includes 2,000 IU of vitamin D3 and 400µg of vitamin K (in K1 and K2 forms) per serving, in addition to having mixed tocopherols, bioactive B-vitamins, and amino acid-chelated minerals, including calcium and magnesium – all in a two-capsule-per-day delivery system. Basic Nutrients 2/Day makes it easier to ensure that you are getting the foundational nutritional support you need for the day. Plus, Basic Nutrients 2/Day is soy-free, gluten-free, and GMO-free!